Boys Noize (Alexander Ridha ), last week announced his brand new EP ‘Go Hard’ which includes a range from classic rave, techno, rap to disco/house and acid. 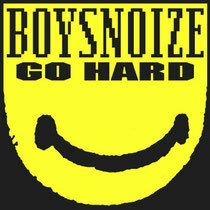 Boysnoize Records (BNR) was founded by Boys Noize in 2005 in order to retain his full artistic freedom while releasing his own music under Boys Noize as well as under different monikers. BNR became a home for multidirectional electronic music. The Berlin-based anarchist collective are celebrating their 100th deafeningly successful release including albums from high-ranked artists Spank Rock, Siriusmo, Housemeister, Strip Steve, EPs from Djedjotronic, Boody & Le1f, Peaches and UZ. And, don’t forget Boys Noize’s debut ‘Oi Oi Oi’ (2007), ‘Power’ (2009) and ‘Out Of The Black’ (2012).